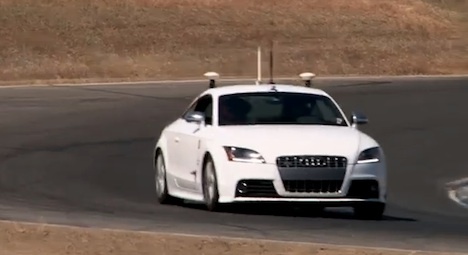 Stanford University’s self-driving Audi TTS, named, er, Shelly, has recently safely reached 120 mph (193 kmph) at the Thunderhill racetrack. Standford researchers say the autonomous car’s performance could get even better. Amazingly, the car raced around the 3 mile track in under two and a half minutes, which is comparable to times reached by professional drivers, although still a few seconds slower. Apart from very nearly matching expert human drivers for speed around a challenging racetrack, researchers say the advancements they are making with self-driving systems are applicable to all future car safety systems. If we can have autonomous cars that can drive up to the limits of what’s possible, and recover safely as they go past those limits, this could really help “ordinary” drivers in potentially dangerous driving situations. Stanford’s self-driving car is a work in progress between the university’s Dynamic Designs Lab and the Volkswagen Electronics Research lab. We’ve reported before on Google’s self-driving program, which is now focused on getting their cars to drive safely on real roads and in traffic. After 300,000 miles of computer-controlled driving, Google’s robot cars so far appear to be safer than human drivers. Stanford’s self-driving program seems to be more focused on pushing autonomous car performance to the limits, with overal future safety and performance of computer-controlled vehicles in mind. How long do you think it will be until robotic cars consistently outperform humans at driving in all conditions? It seems that point is already not very far off at all. Let’s just hope people don’t start parking like that all over the place, just because they can! Next post: Bike Sharing Is One Of Fastest Growing Modes Of Transportation In U.S.